Forex continues to feature significantly in our daily existence, from one-to-one transactions to large-scale, cross-border dealings. An industry ripe for technological innovation, forex is witnessing increased disruption, with industry players leading efforts to make processes around currency trading faster, less costly and more reliable for traders and investors worldwide. The evolving demands of consumers also mean that brokerages are constantly pushing the boundaries of how we understand and participate in forex, with the aim of delivering improved customer experiences. New solutions that include tech-driven tools continually challenge traditional concepts and services that have long inhabited this space, making the industry all the more attractive to a tech-savvy crowd. Yet, it will take some time before we can assess the efficacy of these exciting developments in addressing the industry’s perennial concerns, such as price transparency and tightening regulations. World Finance spoke with Mario Singh, Founder and CEO of Fullerton Markets, to discuss the role of innovation in introducing higher levels of visibility and value, and the measures being taken to keep the industry robust and safe. In your opinion, why is the market susceptible to scandal? Forex is the world’s largest, most liquid financial market, with trade activity that amounts to an estimated $5.3trn each day. Yet, the market remains largely unregulated – a trait that appeals to market participants and new entrants, but also sets it up for bad actors wanting to take advantage of its relatively low levels of compliance. We’ve witnessed forex-fixing scandals and market manipulation of various scales over the past few years, which have been followed by trading probes, prosecutions of senior currency traders and billion-dollar fines. Such issues continue to cast a shadow over the forex community. While there has been pressure to keep institutions and traders in check, adherence to policy is often trickier than imagined. How can scandal be avoided? What role does transparency play? Efforts have been made to rebuild trust and credibility in the industry. In 2017, a global code of conduct for the forex market was introduced to promote fairness and integrity. The code’s 55 principles were drawn up by the Foreign Exchange Working Group and supported by a panel of industry participants. These set the framework for international standards on practices, such as the management of confidential information and settlement of deals. A more transparent forex market also starts with market participants pledging their commitment to uphold regulatory codes. Companies, too, can have more comprehensive reviews of policies and procedures across their forex activities to ensure practices are communicated as transparently as possible to investors, shareholders and regulators. Greater adherence to established codes would provide the impetus for increased visibility in the market and would thereby mitigate risks of scandal. What impact has regulators’ tightening control over the forex industry had on brokers and traders? Tightening control will continue to shape the industry in more ways than one, though its effects may not necessarily be felt the same way across the market. For brokers, stricter regulations that include leverage restrictions or the mandatory provision of a negative balance protection will influence how they operate and perhaps the business model they adopt. Brokers would have to review their client acquisition and retention strategy more closely to make sure that they remain competitive while simultaneously meeting regulators’ requirements. It is important to understand that the main purpose of regulation is not to restrict the trading activities of the client – it is to enforce a safer environment where best practices between the broker and the client can be conducted. What are the advantages of moving businesses to more loosely regulated or offshore jurisdictions? Beyond the commonly recognised advantages of lower taxes and reduced organisational or administrative expenses, setting up businesses in offshore jurisdictions offers a level of flexibility that is not accessible in more regulated environments. More and more companies are leveraging this increased autonomy and value its role in their overall business strategy. In which direction do you think the cryptocurrency market is headed? ‘Cryptocurrency’ has been a buzzword for years, though the extent to which it has taken off varies within the financial industry. Traditional financial institutions have been slower to adopt it and are still in the early stages of developing their own services to complement the emergence of cryptocurrencies. However, cryptocurrencies are predicted to enjoy more price stability in 2019, which will build institutional interest and encourage entry into the digital currency market. With broader regulatory acceptance and more support from institutional investors, there should be exciting developments to look forward to over the next few years. What impact do you think cryptocurrencies will have on the forex industry? Cryptocurrencies and blockchain have brought improved efficiency, accessibility and transparency to the industries they serve. Likewise, the forex industry will be able to benefit from increased visibility through crypto exchanges. By removing the need for human intermediaries, cryptocurrencies will help lower risks in the form of human error, hacking or corruption. The popularity of cryptocurrencies has also seen brokers adding digital currencies to their offerings. Last year, Fullerton Markets started accepting bitcoin as a new funding method for client deposits due to a substantial number of requests by our customers. What this integration offers is an instant deposit process with no delays and transactions verified by blockchain technology. The added security and the protection of personal data continue to be huge draws for users of this service. Why does Asia stand out in particular for the cryptocurrency market? Asia’s propensity for taking on and developing emerging technologies places it at the front of the cryptocurrency revolution and makes it a hotbed for blockchain-based innovation. The region boasts incredibly high mobile usage and widespread acceptance of cashless payment solutions, such as WeChat Pay and LINE Pay, which might explain its readiness for crypto payment, a similarly mobile-based service. The cryptocurrency landscape in Asia will be one to watch, as countries ease controls and gear up for distributed ledger disruption. In Thailand, for instance, digital currency enthusiasts have welcomed the news of the now-permitted investment in bitcoin, Ethereum, Ripple and Litecoin. Meanwhile, in South Korea, where a third of the population either owns or is paid in digital currency, plans are underway to boost cryptocurrencies’ legal status. Why are mobile-first platforms of increasing importance these days? There is no disputing the impact of mobile-led platforms and apps in our everyday lives – they have transformed the way we work, play and socialise. Above all, users prize the convenience and simplicity they offer. With mobile-first platforms set to eclipse traditional, desktop-based internet usage, companies will have to look at taking more of their business onto more accessible channels to cater to on-the-go, tech-savvy consumers. 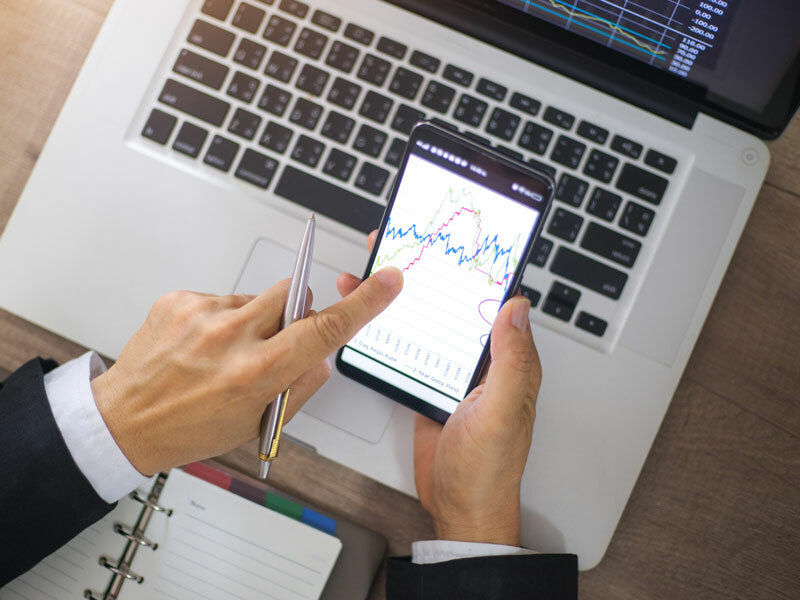 In the forex industry, mobile-based solutions will serve as important tools for traders to store value and transfer assets seamlessly, and in some cases, may even double up as digital wallets. Brokers, on the other hand, benefit from their services being more accessible to clients and from connecting with them on an increasingly preferred medium. This largely means more engagement and more revenue. The idea for Fullerton Markets’ own mobile app was conceived with the understanding that it was no longer enough to simply have a mobile-friendly or mobile-responsive website. To better serve our customers and provide a more effective mobile experience, we realised that our core services had to be fully hosted on mobile. Through the app, our clients can expect all the familiar trade offerings, with the additional features of superior responsiveness and a richer experience with in-app functionality and mobile notifications. In your opinion, why are traders today more discerning than in the past? The confluence of a stricter regulatory environment, the premium that is placed on increased transparency and the large number of forex brokerages available today means that traders are more aware of better protecting themselves from fraudulent activity and recognise the value of partnering with brokers that offer services that best align with their goals. In order to retain their clientele and compete to attract new traders, brokers will have to go beyond commonplace offerings. A deeper understanding of traders’ strategies and goals will help brokers design and deliver more customised solutions. Take, for example, the growing number of clients who participate in copy trading: these customers prefer to spend less time on their trades, but still want to make healthy profits. Through our CopyPip system, traders can access a global network of reliable strategy providers to copy from. Strategy followers set the ratio between their account and that of the strategy provider so the risk and lot size traded are adjusted to their capital. Data-driven tools have also gained traction among traders, providing them with intelligence-backed insights into their business or trading activity. I’m a big believer in data because you can’t manage what you can’t measure. Our business analytics tool, hosted on our digital platform Fullerton Suite, serves to do the same. By collating and presenting valuable metrics such as real-time trading volume to our partners, it allows them to make data-supported decisions that will help strengthen their business or trading strategies. What are the benefits of partnering with an STP broker? Straight-through processing (STP) brokers like Fullerton Markets operate by directly passing clients’ orders to their liquidity providers. The absence of an intermediary dealer in this case allows the processing of orders to be done immediately and ensures a higher level of price transparency. Competitive market bids and high liquidity in the market also mean clients obtain better and faster fills through an STP broker. As it is in their interest that clients make profitable trades, STP brokers often provide traders with useful tools and resources to help them find more consistent success in their trades. Clients can expect to benefit from a whole host of services, including step-by-step tutorials, regular market reports, coaching sessions and live webinars, all of which are designed to bring clients closer to trading success.